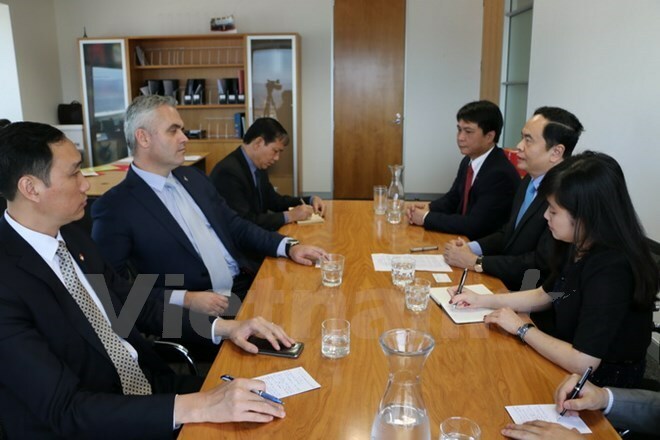 Wellington (VNA) – A delegation from the Vietnam Fatherland Front (VFF), led by President of its Central Committee Tran Thanh Man, is making a working visit to New Zealand from December 3 – 5. The VFF President had a working session on with Fletcher Tabuteau, New Zealand Parliamentary Under-Secretary for Regional Economic Development. At the function, Man noted progress recorded in Vietnam – New Zealand comprehensive partnership since 2009. He lauded practical outcomes recorded in joint projects across economics-trade-investment, defence-security, education, agriculture, technology and aviation. Towards lifting bilateral ties to strategic partnership, the VFF chief suggested New Zealand help Vietnam restructure local agriculture and industry with technology application, and facilitate the entry of Vietnamese agro-forestry-fishery products into the local retail system. He asked the country to encourage its enterprises to invest in Vietnam, particularly in education, agricultural trade, seafood processing, tourism, support industry, and renewable energy. Man took the occasion to thank the New Zealand Government for the recent 500,000 NZD (34,400 USD) aid package for flood victims in central Vietnam. Fletcher Tabuteau said New Zealand always values collaboration and mutual support with Vietnam at regional and international forums, particularly within cooperative frameworks of the ASEAN, EAS, ARF, UN, and APEC. He said room for further engagements remains extensive, particularly in trade-investment, education, and high-tech farming.